210 pages | 26 B/W Illus. 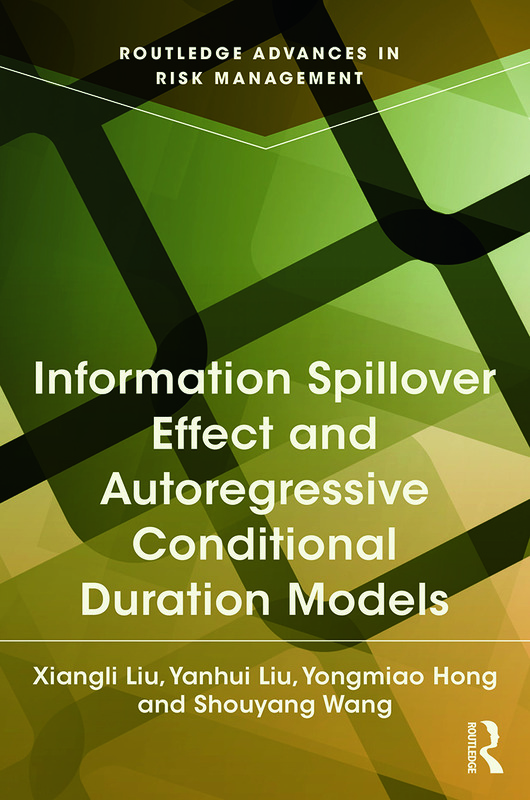 This book studies the information spillover among financial markets and explores the intraday effect and ACD models with high frequency data. This book also contributes theoretically by providing a new statistical methodology with comparative advantages for analyzing co-movements between two time series. It explores this new method by testing the information spillover between the Chinese stock market and the international market, futures market and spot market. Using the high frequency data, this book investigates the intraday effect and examines which type of ACD model is particularly suited in capturing financial duration dynamics. The book will be of invaluable use to scholars and graduate students interested in co-movements among different financial markets and financial market microstructure and to investors and regulation departments looking to improve their risk management. Xiangli Liu received her PhD in Management Sciences and Engineering from the School of Management, Graduate University of the Chinese Academy of Sciences in 2008. She is currently Associate Professor of the School of Finance, Central University of Finance and Economics. She has published over 20 papers in domestic and international journals. Her research interests include econometrics, financial market microstructure and financial risk management. Yanhui Liu received her PhD in Management Sciences and Engineering from the Institute of Systems Science, Academy of Mathematics and Systems Science, Chinese Academy of Sciences in 2005.She has worked in the Development Bank of Singapore since 2005. Now she is the Chief Executive. She has published several papers in domestic and international journals. Her research interests include econometrics, financial econometrics and financial instruments. Yongmiao Hong received his PhD in Economics, University of California, San Diego in 1993. He joined as Assistant Professor, Economics Department, at Cornell University in 1993, and became tenured Associate Professor in 1998 and tenured Full Professor in 2001. Now he serves as a tenured Professor of Economics and Statistics at Cornell University and a Cheung Kong Lecture Professor of Wang Yanan Institute for Studies in Economics (WISE) at Xiamen University. He has been selected as a member of the Thousand Talents Program to promote the recruitment of first-class international talents for the development of national key disciplines. His current research interests include econometrics, time series analysis and application, financial econometrics, Chinese economics and empirical research in financial markets in China. Shouyang Wang received his PhD in Operations Research from the Institute of Systems Science, Academy of Mathematics and Systems Science, Chinese Academy of Sciences in 1986. He is currently a Bairen distinguished Professor of Management Science at Academy of Mathematics and Systems Science, Chinese Academy of Sciences. He is also an adjunct professor of over 30 universities in the world. He is the editor-in-chief, an area editor or a co-editor of 12 journals. He has published 30 monographs and over 250 papers in leading journals. His current research interests include financial engineering, economic forecasting and financial risk management.